Hong Kong does not have the best climate in the world, we know that. Either it’s too hot or too cold and maybe raining at the same time. I found the public buses to be the best way to explore Hong Kong beyond the standard tourist sites. They are cheap, air-conditioned, have a roof top, run frequently and all over the islands. Most of these buses are double-deckers too, so make sure to enter at the first station to get the good view. This is my list of my favorite bus lines through Hong Kong. I will regularly update it, so do come back! Also, feel free to suggest your own routes! Eating and drinking is both prohibited on all public buses. Especially bringing in smelly food or making a mess will earn you the angry stares of other passengers, but bringing in a bottle of beer or some bubble tea is rarely frowned upon. I admit that taking bus N11 at night having a cold Tsingtao in your hands, and staff very rarely sanctions ‘illegal-though-considerate-behavior’, so be respectful that it stays that way. It’s not only a cheaper alternative to the peak tram, it’s also much more scenic and relaxing. The ascent starts on Queen’s Road East next to the Khalsa Diwan Sikh Temple. As it goes up Stubbs Road you get a great view over Happy Valley to your left. After the sharp turn, the bus further climbs up the hill and on a good day, unveils a great view over Kowloon Bay. After you reach Peak Road, you might catch a short glimpse of Aberdeen and Pok Fu Lam, before you arrive underneath the shopping mall on the Peak. This bus route is interesting for one reason. The Rumsey Street Flyover. After the Hill Road bus stop at the West Gate of Hong Kong University, the bus turns left and ‘flies’ through the needle like high rises towards Belcher Bay. After you get on the route 4 expressway, you pass the Hill Road tram depot to your left and quickly arrive at Exchange Square. If you want a preview, check out Google Street View below. After leaving the Shau Kei Wan bus terminal, you quickly leave the busy metropolis behind you and make sharp turns through the forest that form Hong Kong’s backyard. The view over the Tai Tam and Stanley make you feel like you’re far away from where you started, and once you’ve arrived at Shek O beach all city life will be forgotten. This is a ride to dream in. It is both a pleasure to and from the airport, and almost romantic, displaying the busyness and loneliness of a city that is both so very international and isolated. You will hardly find people talking inside the bus, and yet it might be full. It serves both airport employees and budget travellers, and because of that displays globalization much better than the inside of the Cathay Pacific lounge. The bus goes through the airport services district, makes a turn through Tung Chung, takes the longer route around the harbor (better views! ), cuts through Tsim Sha Tsui and the Central Harbor Crossing to Causeway Bay and then goes along Hennessy and Des Voeux Road to the Macau Ferry Terminal. It’s pure melancholia. As much as the N11 reminds you of trade, industries and steel, the 967 will show you the quiet and suburban green refuge that the New Territories provide. After going through the Western Harbor Crossing and past the Port, the 967 cuts through Tsing Yi and Tai Lam and opens Kowloon’s backyard to you. It’s green, there are fewer houses, and the suburban villages around you don’t seem like Hong Kong at all. Before the bus arrives at Tin Shui Wai, get out at the Hong Kong Wetland Park and enjoy the Pearl River Delta in its purest form. Dubbed the Midnight Death Wish Ride, this Minibus goes between Mong Kok and Central faster than the MTR. 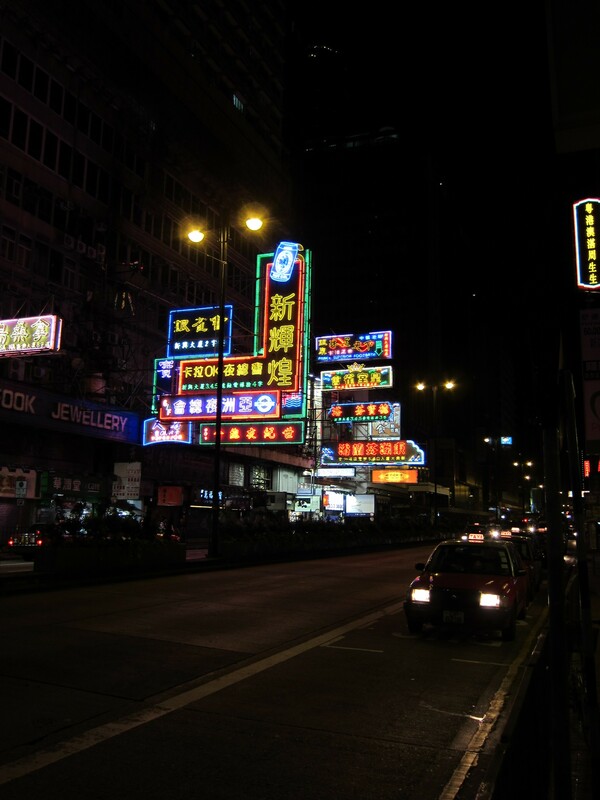 It’s easy to catch from Nathan Road just a little south from Mong Kok station, near the large signs advertising Saunas below. It does not accept Octopus cards, so do have change ready (you pay when you get out). All minibuses are equipped with a display that shows the passengers the current speed. It also beeps when going faster than 85 kph, though in this ride, the beeping seems to act like cheering to the driver, and quality measurement to the passengers. When you want to get out, just scream. Buses in South Lantau only have a single deck, stop more rarely and connect the often far away towns. The two prettiest of these towns, Mui Wo and Tai O are connected by bus #1 which passes highlights like the Tong Fuk beach and the Shek Pik Reservoir, from where you can see the maximum security prison underneath the damn. The S1 conveniently connects the Tung Chung line with the Airport, making this route the cheapest way to the airport from Hong Kong station. Just like the N11, the bus swerves through the services area of Chek Lap Kok, giving you a nice overview over what happens behind the shiny passenger terminals. Here are a few useful resources on bus lines in Hong Kong. Wikipedia has the most extensive collection of bus lines. Google Maps allows you to calculate directions by public transport. CityBus and First Bus show you their bus route conveniently on a map. The New Lantau Bus Co shows you on a map all its routes across Lantau.